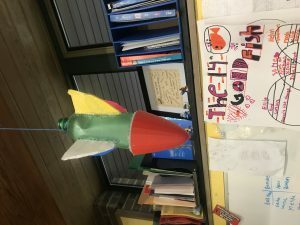 After the first launch my group had to redesign our rocket. Our first step was to analyze the problem. Our problem was that our wings were unbalanced. This was because we only had 2 wings. We also thought it was a little top heavy so we had a lot of debates of if we should keep the extension we had before or take off. We decided we would cut it shorter and put it on the rocket. But we also didn’t know if we should 3D print our nose cone or keep the one we had before. At the end we decided we would add more wings, take away the extension, and 3D print our nosecone. Redesigning was actually very fun and I cannot wait to launch our revised rocket.